Kelser Corporation delivers high performance technology solutions to the enterprise and commercial markets. Our clients include some of the most recognizable companies in America today. Born from a mainframe database consulting organization in 1981, Kelser remains a hallmark of reliability, efficiency and innovation. For over 30 years, our reputation of unmatched customer service has become a staple of the Kelser brand. Today, Kelser continues to provide innovative products and leading edge services designed to provide maximum stability, security, and scalability. Our business is focused on Professional Services which includes Project Management, Engineering, and Executive Solutions; and Supply Chain Products and Services. Kelser is headquartered in East Hartford, CT. Together with our partners we aim to be the premier provider of technology solutions in North America. 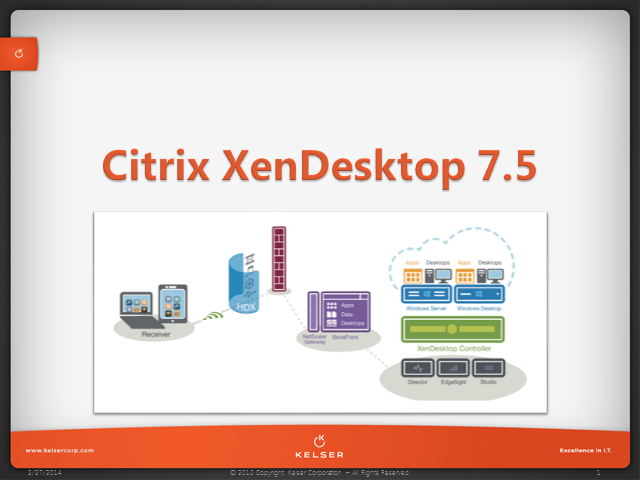 Join Kelser's Data Center Practice Manager Matt Kozloski as he expolores Citrix XenDesktop 7. Citrix XenDesktop is the award winning solution for virtual desktop delivery and apps on demand. XenDesktop delivers virtual apps and desktops on a single unified platform, providing self-service access for users and simplified management for IT. Take a pre-release look at VMware Virtual SAN technology and gain exclusive access to information on the new software-defined storage tier. VMware Virtual SAN™ pools the compute and storage resources of vSphere® hosts, providing simplicity, enterprise-class performance and significant savings. Are You Ready for vCloud? Learn how vCloud Hybrid Service (vCHS) can facilitate your adoption of cloud with virtualized networking and affordable, resilient capacity. Kelser vCloud experts will also talk about extending vCHS into your existing IT investments. Attendees will have the unique opportunity to enter the Kelser vCloud early access program! vSphere 5.1: Federate. Manage. Scale. Protect. Learn about four key features and improvements of vSphere 5.1 in this online webinar, hosted by Kelser's Senior Virtualization Engineer: Matt Kozloski. Matt will be your guide, taking you through vCenter identity management and directory federation with vSphere Single Sign-On (SSO), managing a vSphere 5.1 environment with the vSphere Web Client, scaling your virtual environment with vSphere 5.1 Distributed Switch (vDS), and finally protecting your environment with the all new vSphere 5.1 vSphere Replication.